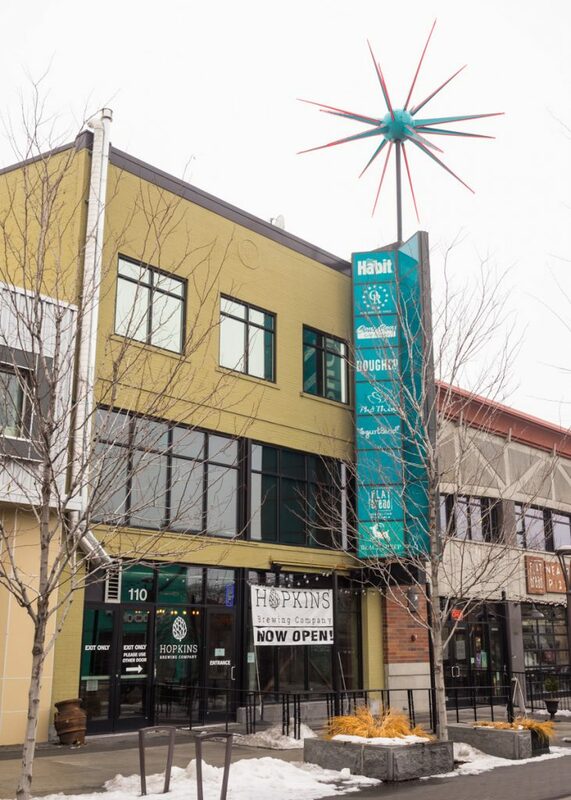 Welcome to the Family, Hopkins Brewing Co.
Utah’s newest brewery, Hopkins Brewing Co., came out of nowhere to open its doors on the very last day of 2018. 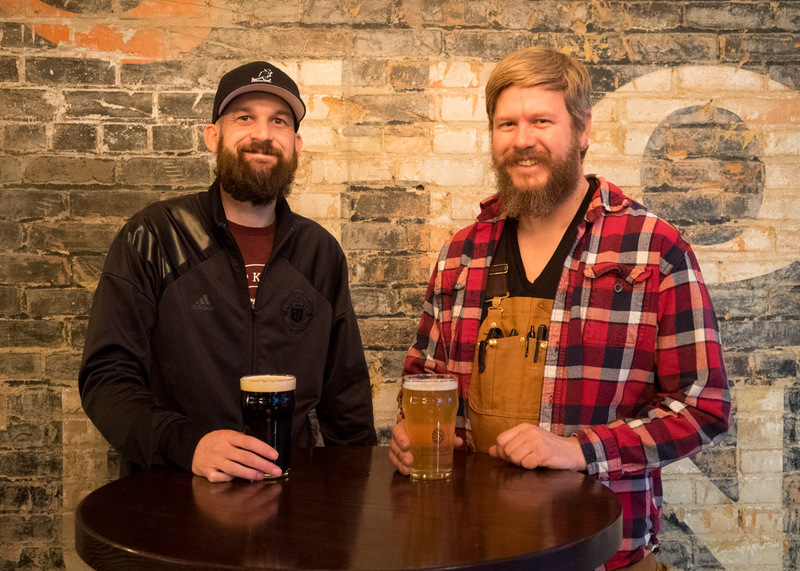 They quietly took over the former Sugarhouse location of Epic Brewing Company and launched with a whopping seven beers on tap. Not a bad start! Many local beer lovers did a double take when the announcement came, wondering who this Hopkins was. 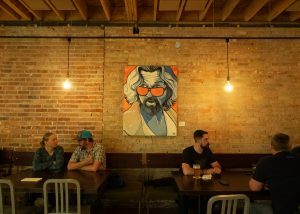 But the surprise opening has turned out to be a pleasant one and a welcome newcomer to the Salt Lake beer scene. As a fan of local beer, I dutifully made my way over to the new Hopkins brewery to see what it was all about. What I found was something completely unique. No matter that the location is familiar, Chad Hopkins and his partners are bringing something fresh to the Sugarhouse neighborhood. These guys aren’t messing around. This brewery wasn’t opened on a whim. It’s been in the making for the past decade, and we’re the lucky ones who get to experience it. Before now, the lucky ones were Hopkins’ friends. They had the exclusive pleasure of drinking the many homebrewed beers he kept on tap at all times. Hopkins usually had at least eight to choose from at any given time. That’s a lot of brewing! But for a man intent on becoming a professional, it was just a matter of training. “It’s been a long-time dream. 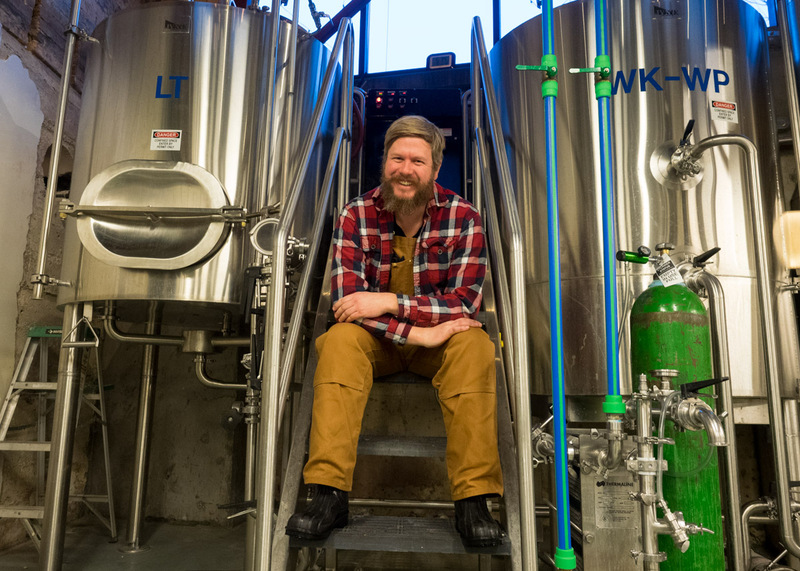 Probably since I was a teenager,” he tells me, “I started homebrewing about 10 years ago with a brewpub in mind.” Back then the beer scene in Utah was limited. Hopkins traveled the country in search of wide-ranging beer experiences and developed an appreciation for an array of styles. That combined with a seriousness that stretched beyond hobby status, achieving his dream was all but predestined. Hopkins’ considerable investment in his brewing technique did not go amiss and was appreciated by many. “People offered to buy my beer for years. And I’m like no, beer is for sharing. Come drink my beer. Someday I’ll own a brewery; then you can pay me,” he tells me. The dream began to take shape about five years ago, but the reality of that dream turned out to be even better than he imagined. 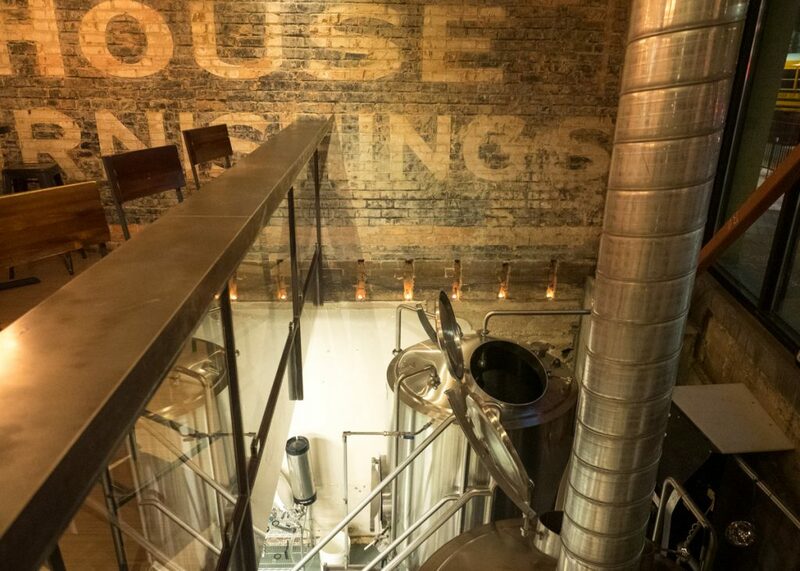 Hopkins grew up in Sugarhouse but didn’t think it was feasible to start a brewery there. Originally, he looked at space on State Street near the original Epic brewery and made a friendly phone call to them for advice. Instead he was offered the Sugarhouse brewhouse. He’d been there but didn’t realize there was a brewery hidden away downstairs. A brewery with his name on in. “Being here in Sugarhouse is pretty awesome. I love being here. It’s very nostalgic for me,” he says. 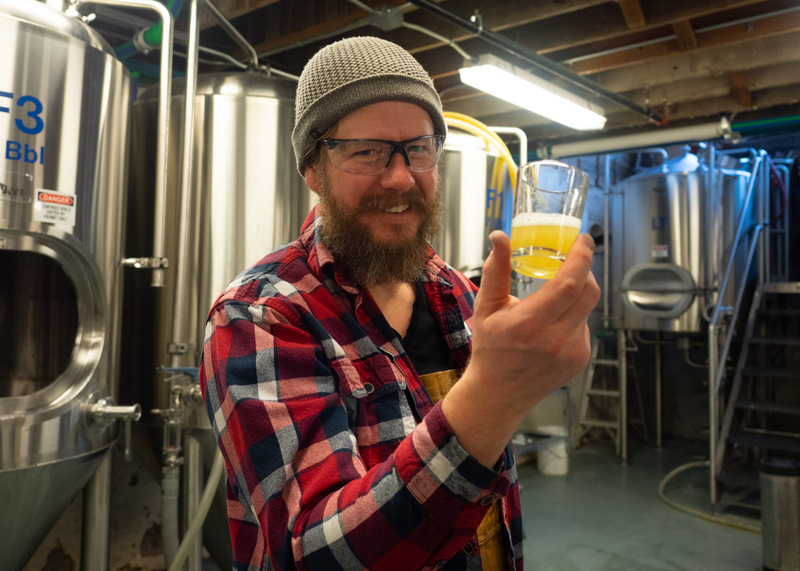 Transitioning from homebrewing in his basement to commercial brewing has been amazingly smooth for Hopkins. His meticulous practices and professional grade equipment positioned him perfectly to take the natural next step. His professional life also gave him experience that uniquely qualified him for this moment. Hopkins worked for twenty years in the restaurant industry and spent fifteen years of that in management. He brings not only kitchen management to the table, but also spent time opening restaurant locations and even helping those that were struggling. He’s taken the time to build a team of partners who share his vision, including Teddy Walton who works closely with Hopkins and manages the front of the house at their new place. Walton’s previous experience in bars, restaurants, and customer service is sure to be an asset. What really comes across when you talk to both Hopkins and Walton is their passion. For them, it’s not about getting rich or following grand ambitions. They have no intention of expanding beyond the capacity allowed them at their small Sugarhouse brewery. The sense of pride that comes from brewing good beer, serving good food, and seeing happy customers fill the tables is enough. “We’re here all day, and It’s so rewarding at the end of the day when people love your beer. People say they love the vibe here,” says Hopkins. I can’t disagree. 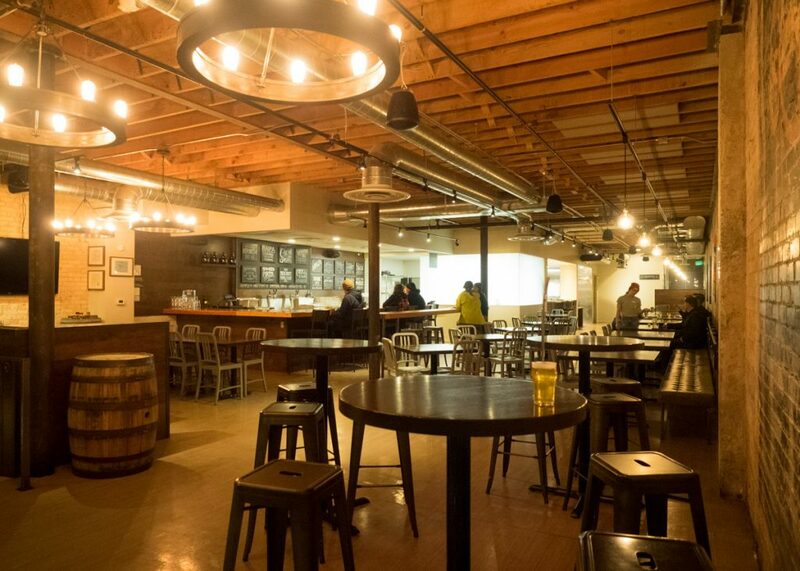 The brewery is a bar, not a restaurant, but there are plenty of good food options available. It’s a casual place to lounge with friends where customers are not confined to a table or pestered by a waitress. Order food at the register and take your number with you anywhere you want. Get a beer at the bar and enjoy the freedom to roam around as you please. The lighting enhances the original brick and wood that adorns the historic space. 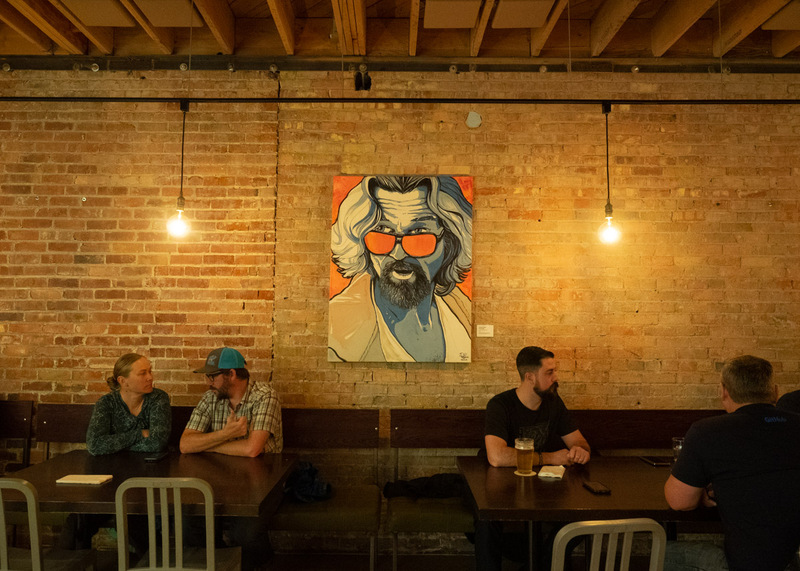 Local art hangs on the walls and you can even peak at the brewery downstairs from a vantage point near the entrance. The beer is not your average lineup. There is something for everyone, but Hopkins isn’t shy about brewing something different. Expect the lineup to rotate and change with the seasons. I was quite taken with the smoked jalapeño porter. Before brewing it, Hopkins grilled and blistered the peppers to help them meld with the smoked malt of the beer. The flavorful 4% ABV hop-forward pale ale entitled NAIPA (Not an IPA), is brewed with Centennial, Chinook, and Mosaic hops. The bourbon barrel porter on nitro has not been aged in whiskey barrels, but rather was brewed with bourbon barrel cubes for some extra dimension without the ingredient of time. The newest addition is the citrusy, floral Cascade oat saison. I love a good saison and this one doesn’t disappoint. If you’re hungry, food offerings range from appetizers to full meals. Quality, sustainability, and local ingredients are priorities for the Hopkins kitchen. They seek out humanely raised meats for their burgers, wings, tri-tip sandwiches, and carne asada tacos. 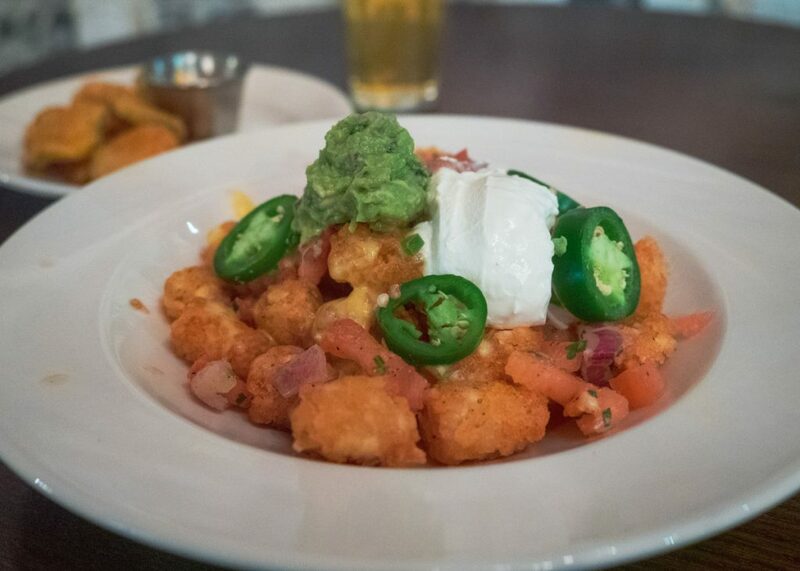 I zeroed in on the loaded tot-chos smothered in beer cheese, jalapeños, sour cream, guacamole, and pico de gallo. They were awesome, but I can’t wait to try out the other dishes. I’m really looking forward to seeing fish & chips hit the menu. Walton is English and plans to make an authentic version to satisfy his discerning tastes. In the future, Hopkins plans to acquire a canning line to allow them to brew high-point beer to be packaged in 16 oz. cans. These will be available for purchase directly from the brewery with no plans for distribution. There are also plans to feature live music from local acoustic jazz, folk, and blues artists. 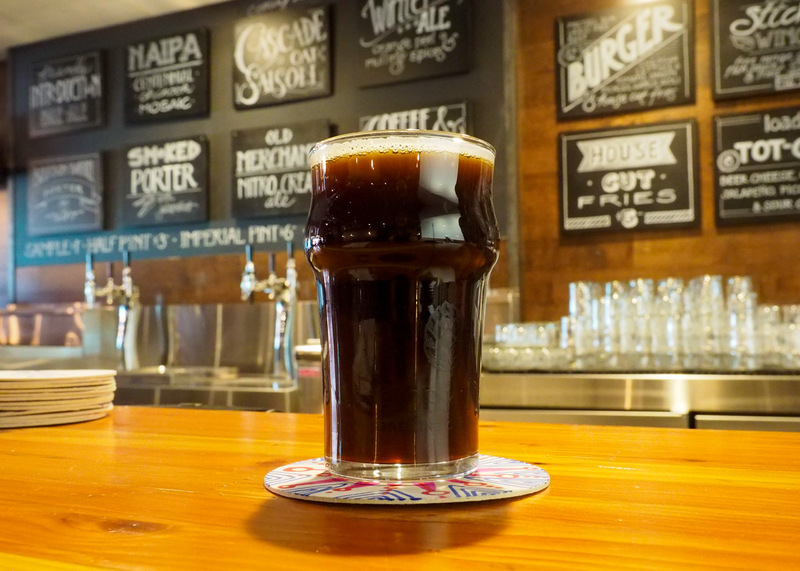 It’s the neighborhood small-batch brewery Sugarhouse has been needing. Before long it’ll fuse into the local landscape and we won’t remember when Hopkins wasn’t just another member of the family. 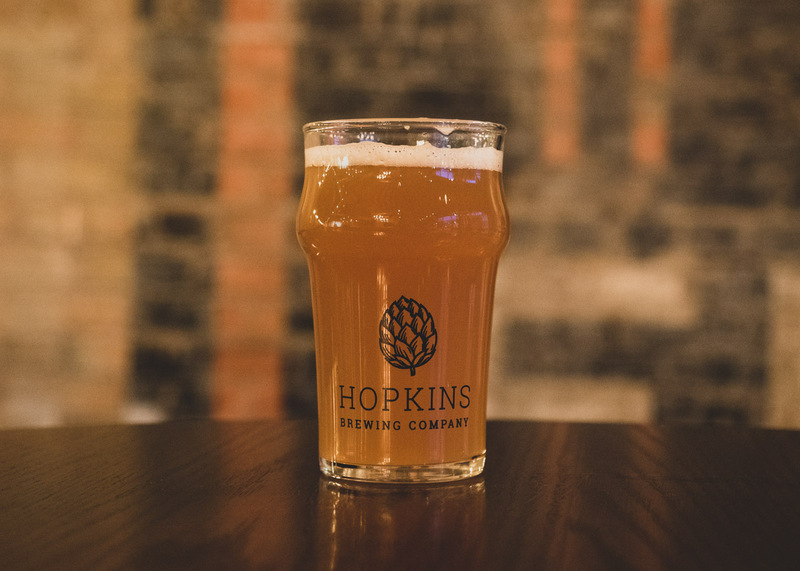 Follow Hopkins Brewing Co. on Instagram, Facebook, and Twitter. Thank you for the info! Can’t wait to try it!